Make Activia Your Probiotic Choice. Start with Activia coupons. 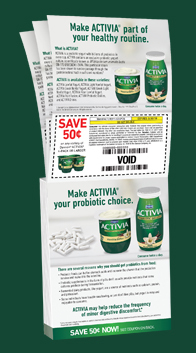 Subject: Make Activia Your Probiotic Choice. Start with Activia coupons. 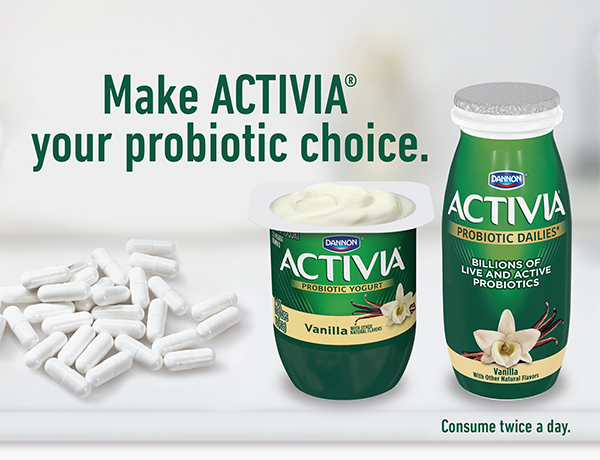 Make ACTIVIA your probiotic choice. Probiotic foods can buffer stomach acids and increase the chance that the probiotics survive and make it to the intestine. Fermented dairy products, like yogurt, are a source of nutrients such as calcium, protein, and potassium. Some individuals have trouble swallowing, or just don’t like pills; but yogurt is easy and enjoyable to consume. Both studies were designed to investigate the effect of ACTIVIA on different gastrointestinal (GI) outcomes, including GI well-being and frequency of minor digestive discomfort, in healthy women. 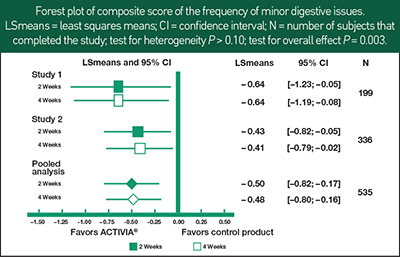 In both studies, and in the pooled analysis, the composite score of the frequency of minor digestive issues over the two-3 and four-week1,2 test periods in the ACTIVIA group was signiﬁcantly lower (P<0.05) than that in the control group. *Consume twice a day for two weeks as part of a balanced diet and healthy lifestyle. Minor digestive discomfort includes bloating, gas, abdominal discomfort, and rumbling. 1. Guyonnet et al. Br J Nutr. 2009;102(11):1654-62. 2. Marteau et al. Neurogastroenterol Motil. 2013;25(4):331-e252. 3. Data on ﬁle. ©2018 The Dannon Company, Inc. All rights reserved. Get your coupon referral pad today!